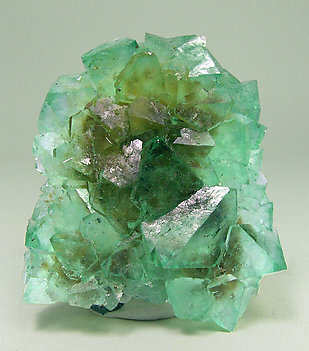 Fluorite octahedral crystals, one of them dominant, with an intense and vivid color, with small darker crystals with Quartz. On matrix. While this locality has produced lots of material and quite often produces good ones, this octahedral Fluorite is really nice. 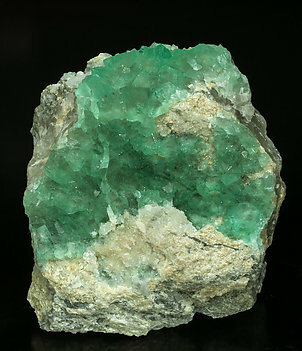 This is due to the crystal size, their definition and the intensity of their color. A major sample for a reasonable price. 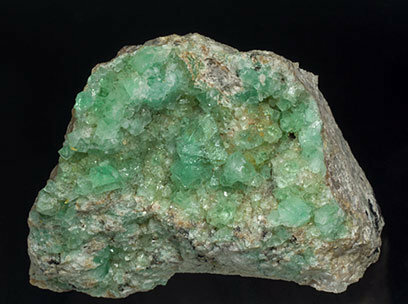 Druse of very sharp octahedral crystals that are translucent, have a vivid and uniform green color and are on a matrix of granitic rock. Octahedral crystals with small cube faces on the vertices. 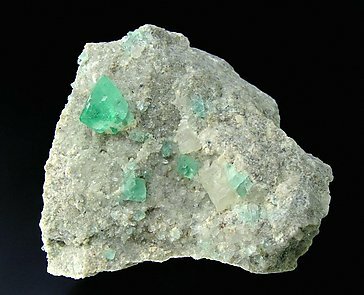 They are translucent, have a uniform green color and are implanted on a granitic rock matrix with small white Quartz crystals. Very sharp octahedral crystals on a granitic rock matrix. They are transparent and have a uniform green color. The sample is from the Joan Abella collection and we’ll send the label to the buyer. 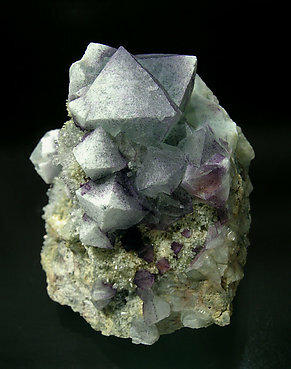 Aggregate of very sharp octahedral Fluorite crystals. 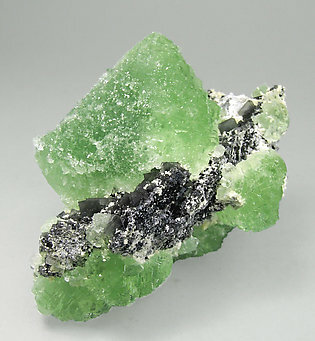 They are between transparent and translucent and have an intense and very uniform green color. We call attention to the locality. 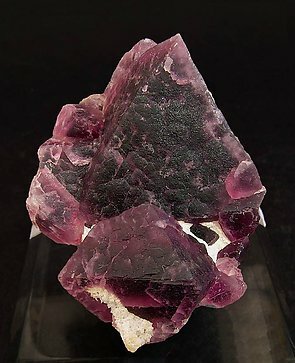 Crystals are octahedral and the faces and edges are well defined and deep violet, so dark that it is nearly black. 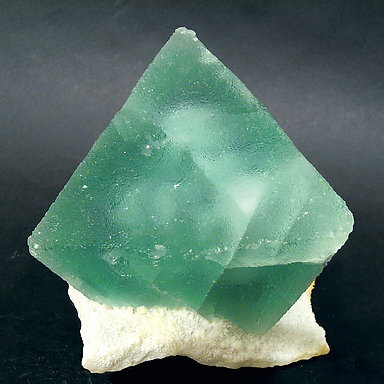 The Fluorite octahedrons of this piece are distributed "in crescendo" and just finishing in two main interpenetrated crystals. The color is curious, with a mélange of purple and green and white zones giving them a "snowy" aspect. This group on matrix of green octahedral crystals with very well defined faces and edges came from a not well known Australian locality. 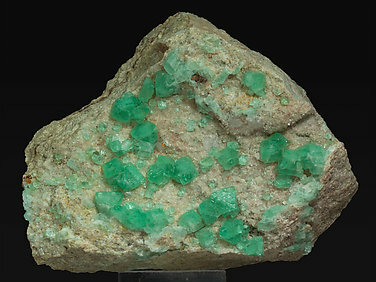 Crystals from this site grew as very close groups in which it is difficult to define the crystalline forms. 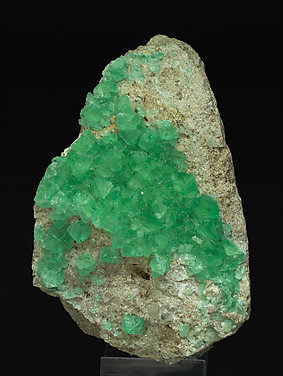 On this specimen, however, there is an isolated sharp octahedron, very bright and of extraordinary emerald green color. 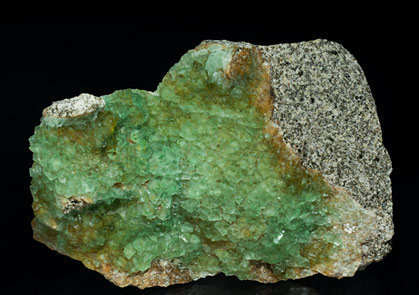 Druse of very sharp octahedral crystals, translucent, with an intense green color and coating a granite matrix. A Spanish classic from a currently closed locality that only sporadically produces samples of this quality. 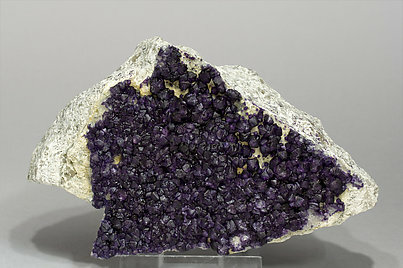 Given to Sr. Folch by Ramón Brumós Albero, a well-known amateur mineralogist of the last century. 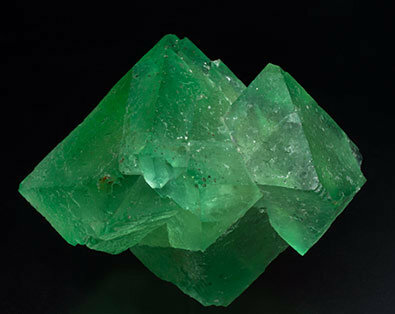 Group of very sharp and translucent octahedral crystals, with a very intense green color, that partially coat a granite matrix. A Spanish classic from a currently closed locality that only sporadically produces samples of this quality. This piece is from an old collection. 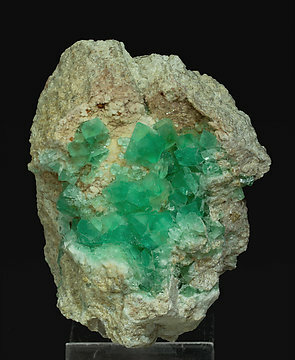 Isolated octahedral crystals with intense green color and polycrystalline growths on their faces, implanted on a granite matrix. A Spanish classic from a currently closed locality that only sporadically produces samples of this quality. This piece is from an old collection. 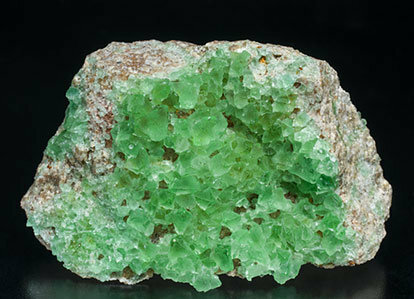 Group of very sharp, translucent, octahedral crystals with a very intense green color and partially coating a granite matrix. A Spanish classic from a currently closed locality that only sporadically produces samples of this quality. This piece is from an old collection. The octahedral crystals are typical of this locality, but in this case they have reached an unusually large size. The color is deep and on one side you can see clear violet to green zoning. 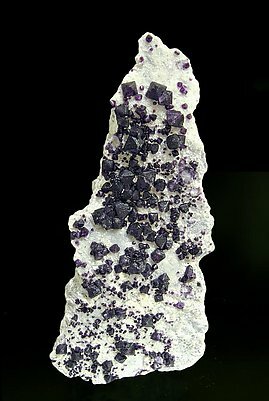 Nice crystals of octahedral Fluorite on matrix. 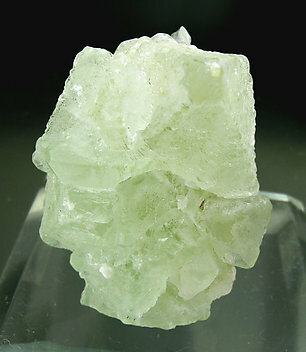 It is a good size, has good color, and shows good contrast with the Albite and Quartz matrix. 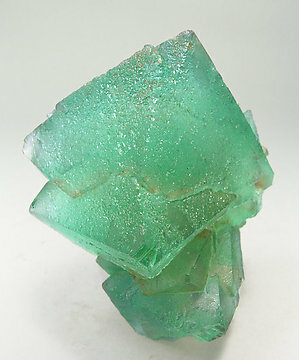 It is difficult to get competitive specimens of these Fluorites as few are found and prices are high. I got this one from an old batch so it still has a good price-quality balance. Group of very sharp octahedral crystals. 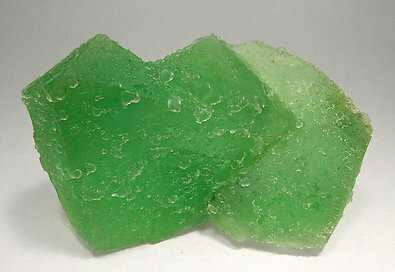 They are transparent, bright and have an excellent, very intense green color. From a recent find in Riemvasmaak in 2008. 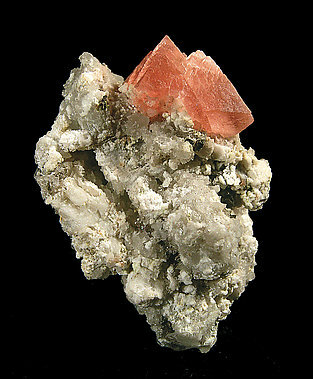 Very aerial group of very sharp octahedral crystals of a considerable size. 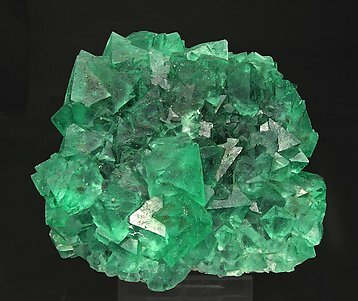 They are transparent, bright and have and excellent, very intense green color. From a recent find in Riemvasmaak in 2008. 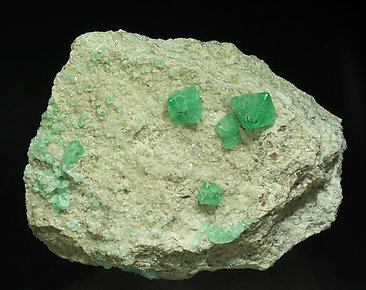 Group of transparent octahedral crystals with a very intense and uniform green color, some of them with centered inclusions. 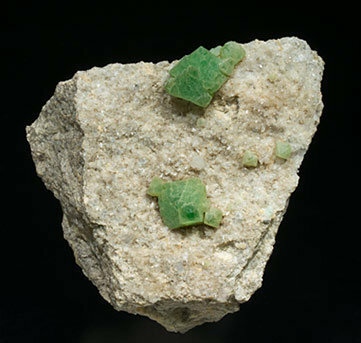 Druze of small octahedral crystals with their faces and edges slightly curved. They are bright and have an extraordinarily deep violet color. They are transparent and are coating a rocky matrix. 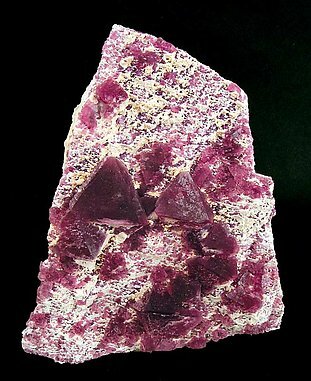 Octahedral crystals of considerable size, very well defined with a deep and uniform color and good luster, which not so frequent in the samples of this locality. 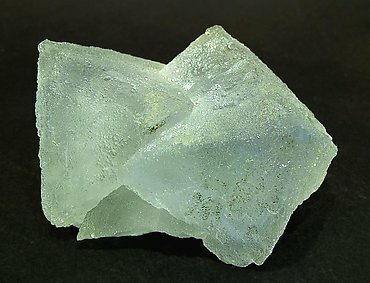 Two octahedral Fluorites that hug each other. Their surfaces are complex as they have numerous small faces that give them a sugary look. They are a light green color.